The Outline pane contains a list of all elements of the currently used graph. 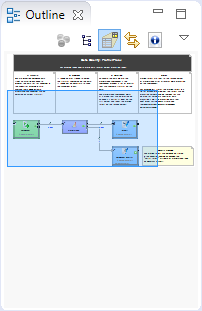 The graph components, edges metadata, database connections or JMS connections, lookups, parameters, sequences, and notes are editable from the Outline. You can both create internal properties and link external (shared) ones. Internal properties are contained in the graph and are visible there. You can externalize the internal properties and/or internalize the external (shared) properties. You can also export the internal metadata. 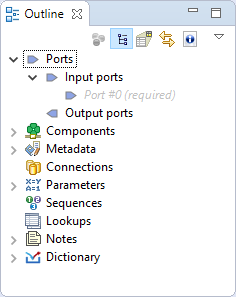 If you select any item in the Outline pane (component, connection, metadata, etc.) and press Enter, its editor will open. Activate the Link with Editor yellow icon in the top right corner and every time you select a component in the graph editor, CloverDX will select it in the Outline as well. Although this is convenient for smaller graphs, turning it off for complex graphs prevents the Outline from expanding the big list of components repeatedly when you are working in the graph. The Outline Pane Buttons affect what is being displayed in the Outline. There are two buttons in the upper right part of the Outline switching between Tree View and Graph Minimap, and the Link With Editor button. 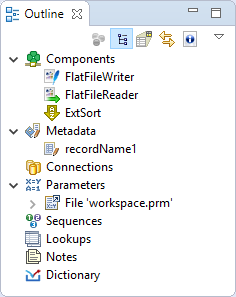 In the tree view you can see the tree of components, metadata, connections, parameters, sequences, lookups and notes. Tree View is the default Outline view. The Graph Minimap is an Outline view not displaying the graph elements but the preview. To switch to the Graph Minimap use the second button from the left in the top of the Outline. You can see a part of some of the example graphs in the Graph Editor and the same graph structure in the Outline pane. In addition to it, there is a light-blue rectangle in the Outline pane. You can see exactly the same part of the graph as you can see in the Graph Editor within the light-blue rectangle in the Outline pane. By moving this rectangle within the space of the Outline pane, you can see the corresponding part of the graph in the Graph Editor as it moves along with the rectangle. Both the light-blue rectangle and the graph in the Graph Editor move equally. You can do the same with the help of the scroll bars on the right and bottom sides of the Graph Editor. To switch to the tree representation of the Outline pane, you only need to click the first button from the left in the upper right part of the Outline pane. Link With Editor button switches on a link between the currently selected element from the Outline and the currently selected element from the Graph Editor. If you click on a component in Graph Editor and this option is enabled, the component will be highlighted in the Outline too. Show Element IDs shows or hides element IDs of graph elements (components, metadata, etc.) in Outline. Element ID is displayed behind the corresponding element name. 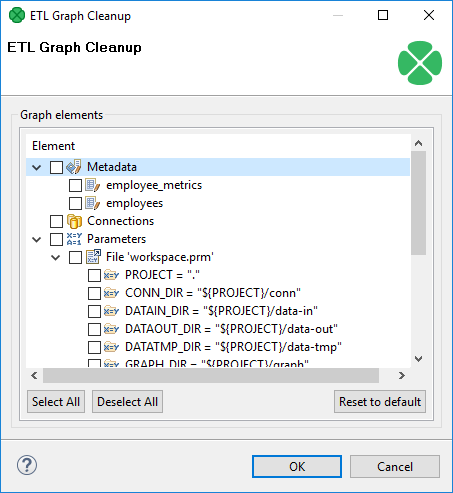 Graph Cleanup assists you in removing unused elements from a graph. 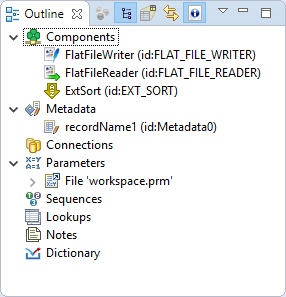 The dialog helps you to remove unused metadata, connections, sequences or lookup tables or dictionaries, but it does not remove unused parameters. The removal of unused parameters might affect other graphs in the project. The Graph Cleanup can be opened by right click from the Outline pane or Graph Editor pane using Cleanup unused elements option. If you open the dialog, the unused parameters will be preselected. You can deselect any of preselected items or add any item or items. The Graph Cleanup dialog contains buttons to Select all elements, to Deselect all elements and to Reset to default selection of elements. To lock any of these elements, right click it in Outline and click Lock. Provide a message to be displayed if a locked item is being edited. You can use the default one. Lock is not a security tool - anyone can perform unlock and locks are not owned by users. In various places (such as the Transform Editor), you are warned if you are accessing a locked element, e.g. modifying locked metadata. Figure 20.11. Accessing a locked graph element - you can add any text you like to describe the lock.